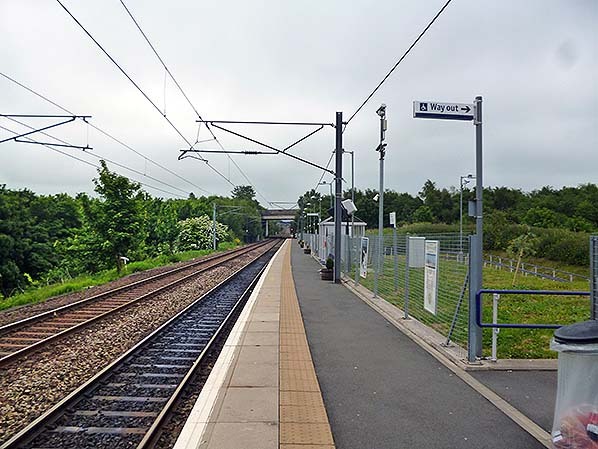 Notes: Newcraighall was never a station on the Waverley Route but was several hundred yards south-east of the short-lived Niddrie station site(s). Spaven (2015) notes that the train service which was ultimately intended to provide the framework for the Borders Railway timetable was launched on 3 June 2002 when ScotRail’s Edinburgh CrossRail service began operation to Brunstane and Newcraighall on the surviving (freight-only) section of the Waverley Route between Portobello Junction and Millerhill. Psychologically this was an important boost to the Borders rail campaign, and soon proved to be a successful addition to the passenger network. Newcraighall is a park-and-ride station, its car park accommodating 565 vehicles in 2015. In the year 2013-14 an estimated 222,000 passengers used the station. 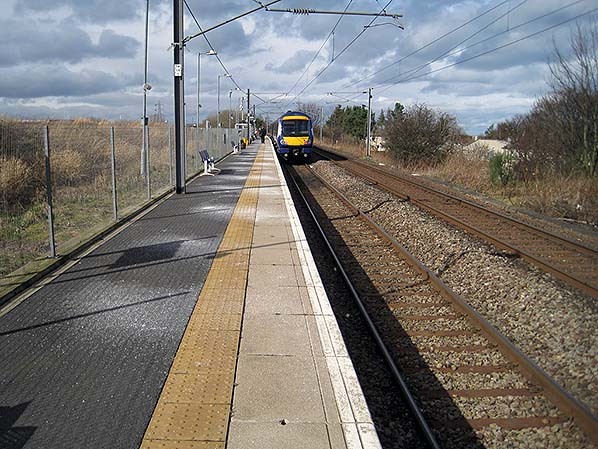 It consists of a single platform west of the double tracks, one of which is a freight loop from the East Coast main line and serves Millerhill Yard, and both tracks are provided with overhead electrical equipment. 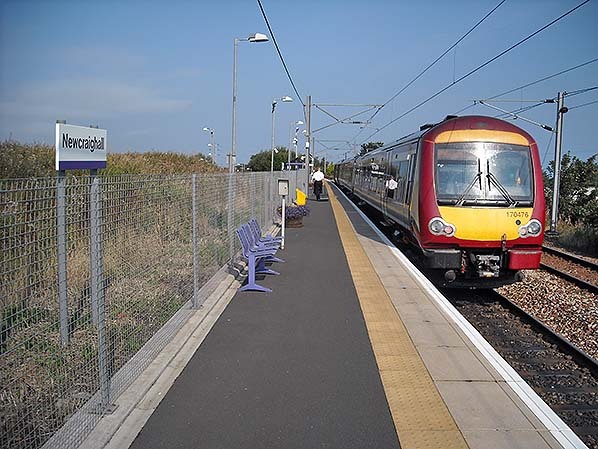 The unstaffed station has the standard facilities of the later Borders Railway stations, although its glazed metal waiting shelter is of an earlier design. On opening the Newcraighall – Edinburgh Waverley service was half-hourly each day, including Sunday. 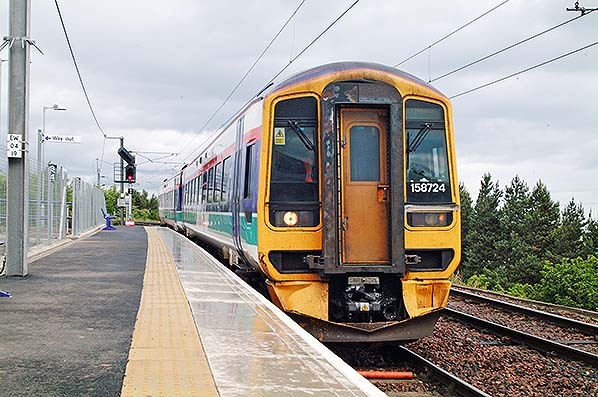 From 6 September 2015 the route was extended southwards to Tweedbank, with trains calling every half hour in each direction on weekdays and hourly on Sunday. A Class 158 DMU is seen arriving at Newcraighall station with a service from Edinburgh Waverley on 4 June 2002, the day after the station opened. On the morning of 3 September 2010 Class 170 DMU 170 476 stands at Newcraighall station. At this time Newcraighall is the southern terminus of the service from Edinburgh Waverley. The view is looking northwards. The ScotRail signage and the lighting are of styles now superseded. In 2015 the station was fitted with bilingual nameboards. Newcraighall station looking south-east in June 2013. Newcraighall station north-west towards Brunstane and Edinburgh in March 2014. A Class 170 DMU from Edinburgh Waverley waits at the platform before making the return journey.